What makes this shirt special, besides there being very few created? Umbro has launched a limited edition box set of England's new 2009/11 home jersey. This limited edition official England jersey has Slovakia 2009 embroidery underneath the crest, as worn by the players for the match. Slovakia was the first team England played against while wearing their new kit. This version of England's new official home shirt comes in a premium gift box, carefully wrapped in commemorative tissue paper with a red ribbon that hearkens to the St. George's cross. The box is also embossed with an England team badge and Umbro logo. Umbro has created a masterpiece that honors the heritage and legacy of the Three Lions. 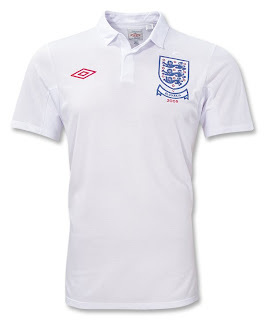 The shirt includes embroidered England team badge and Umbro logo. Open fabric collar design. Climate controlling technology pulls sweat away from the skin for cool comfort. Shoulder darn for an improved fit. Anatomically tailored sleeves for a great look and excellent feel. Stretch rib and woven material.Note: Size measurements are the chest size.